Abstract: Nasal suspension drug products consist of API particles suspended in an aqueous system in the presence of a range of different excipients. For suspension nasal products, the API particle size is a key critical material attribute, which will affect emitted API particle size and regional deposition of API in the nose. In addition, the particle size of the API will affect the rate of dissolution and permeability at site of deposition in the nasal epithelium and thereby systemic exposure of the API from the nose. The paucity of validated methods for characterizing API specific drug particle size distribution (PSD) in nasal formulations has resulted in limited understanding of the relationship between API PSD, regional deposition in the nasal cavity, dissolution, and absorption of the API from the nose. Although PSD can be readily determined by a number of methods prior to formulation into a finished product, the primary challenge has been to determine the PSD of the drug substance in the finished nasal aqueous suspension products in the presence of undissolved excipients. Excipients often exhibit a broad PSD and a substantial number of excipient particles may exist in the same size range as the drug substance, thus complicating drug substance particle size determination. Morphology-directed Raman Spectroscopy (MDRS) is a promising approach for characterizing particle size of API in aqueous nasal spray suspension formulations. Morphological filters are used to allow the detection of a statistically relevant number of API particles. This approach allows the chemical identification of API in situ within complex nasal formulations which can directly benefit the BE requirements for ANDAs.Summary: Demonstration of a combination of dissolution testing and morphologically-directed Raman spectroscopy (MDRS®) of a nasal suspension was able to discriminate between differences in API particle size in nasal suspension formulations. 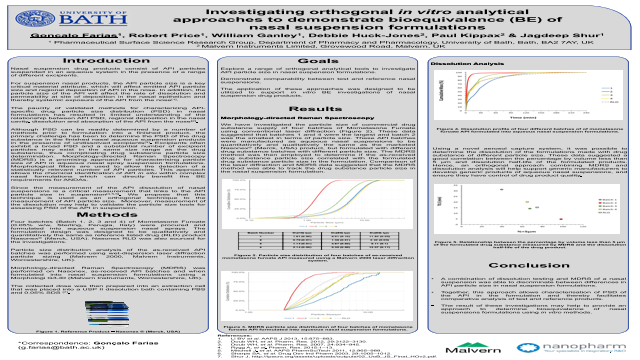 The approach allowed characterization of particle size distribution of the API in the formulation facilitating comparative analysis of test and reference products to help determine bioequivalence of nasal suspensions formulations using in vitro methods.References: 1. Li BV et al. AAPS J 2013, 15:875–883. 2. Doub WH, et al. Pharm. Res. 2012, 29:3122–3130. 3. Doub WH, et al. Pharm. Res. 2007, 24:934–945. 4. Rygg A, et al. Pharm. Res. 2015:1–13. 5. Mitchell J, et al. AAPS PharmSciTech 2011, 12:965–988. 6. Sharpe SA, et al. Drug Dev Ind Pharm 2003, 29:1005–1012.